Are you really good at managing projects? Are you a real Success as a team lead, a project engineer, or a project manager? Or are you just surviving, hoping for the best, keeping your fingers crossed all the time? Maybe you are feeling that choosing Project Management was a wrong decision…. it hardly leaves you any time for your family, friends, hobbies etc. The real test of a project manager is when we ask your team, in your absence, if they would join you in the next project you are leading. If they back out, it clearly indicates that you have failed in your job as a project manager, even if the project succeeded. Fret not… Things can be chaotic at the moment, but they can be better, and can be improved, if you agree to follow some steps. You can read my story about how I accelerated my career with the PMP certification. But PMP certification is not the only way. There are many other ways to jump-start your career in project management. What does Jump Start Mean? According to the Webster dictionary, Jump-Start means “to impart fresh or renewed energy to” achieve something. In the earlier editions of the Project Management Body of Knowledge (PMBOK Guide), published by PMI, there was hardly any reference to the art of project management. It was more like a science – follow the 10 knowledge areas, 5 process groups, and the project would be managed. However, starting the Fourth edition of the PMBOK Guide, and further elaborated in the fifth edition, published in 2013 by PMI, there is a marked difference and expansion to the Interpersonal Skills of a Project Manager. PMBOK Guide now clearly acknowledges the importance of this aspect in project management for success. If you build your competence, and credibility in implementing these interpersonal skills in your work and daily life, you will be able to have tremendous success, and that too quite fast! What are the Challenges for a Project Manager? Most of us, when we start our career, begin at the lowest level, doing the donkey work. We learn by making mistakes, and after a while, become good at doing the technical work well, without supervision. Hopefully, management notices, and you get promoted. After a couple of promotions, you are quite happy, enjoying the work, and the perks. You are responsible, manage your own time well, and get things done efficiently and effectively. Then comes the BIG Promotion – Management decides to promote you as a Project Manager. You are elated, and start distributing your new name cards. But soon after, things begin to change dramatically. Previously, you were responsible for your own work. You could manage your own time, and get things done. But as a project manager, you are not doing the real work yourself. It is your team members, your subordinates who are doing or not doing the work. And your job is to manage is motley group. And if they happen to come from different cultures, different countries, with different age groups, it becomes even harder to manage them. What are the Interpersonal Skills You Must Master as a Project Manager? The hard skills – your engineering skills, architectural skills, programming skills are easy to do, since you studied them in college, and on the job. It is the soft skills that are generally not taught in college, or on the job. And these are the ones that really matters in the long run. You can hire an expert, a consultant to provide you with the expertise (hard skills), but generally, you don’t hire someone to communicate on your behalf. This is what you need to do on your own. The better you get at communicating, negotiating, problem solving, leading, motivating, and coaching your team members, the faster you will be noticed, and the higher will be your rise in the organization. There are several, time tested, proven ways to jump-start your career in Project Management. A SWOT analysis is a common marketing tools to find out Strengths, Weaknesses, Opportunities and Threats. You can try it on yourself, to find out your own personal strengths and weaknesses. You could try a sophisticated software tool, but a simple questionnaire can be a great help too. Try this one at MindTools for starters, or check out the SWOT Analysis – Using Your Strengths to Overcome Weaknesses. 2. Master the Soft Skills. Read books, and Attend Training Courses. The more you read and study this art, the more will your knowledge grow. And when you put it into practice, your experience and skills grow exponentially. One of the first things you must improve is your Communication Skills – by this I mean your Public Speaking Skills, and Listening Skills. There are several things you can do – Join a local Toastmaster’s club, read communication books, or attend a practical workshop on improving communication skills. My suggestion is to attend a workshop or join Toastmasters. It is absolutely low cost, and there are so many encouraging people, that your skills will begin to improve almost immediately. Plus you get to network from a horde of similar people, and many could be in high, powerful positions, who could give you tips on networking, jobs, news etc. 3. Ask for Feedback. And Listen. Most project managers are afraid to ask for feedback, lest they hear something negative. Most are already way behind in their work, that there is no time to ask for feedback, and add more work on the plate. However, good, honest feedback is really helpful. You need to find someone who knows you at work, and can offer some constructive criticism. You can also ask your team members – what can we do differently to improve the situation. After that, just keep shut, and listen to the suggestions. Take notes, and write down everything mentioned. Do not judge it or disregard it. Just keep writing. Later, you can analyze it, and choose which ideas are good, practical, and even prioritize them for implementation. Active Listening is one of the most important soft skills. You should practice it, and you will be amazed at the extra things you will hear, which you might have been completely oblivious to. When you listen actively, you are not waiting for the other guy to shut up, so you can begin speaking. But you are listening with empathy, with kindness, without interruption, and showing genuine care and attention. Just this gesture alone made me a great manager in my team. My team suddenly felt that I was open to suggestions, I listened and I gave them the respect, and the time & attention they needed. Sometimes, all they need is a shoulder to cry on… they don’t need your solutions. They just need you to listen! So do this simple thing regularly. I am a great proponent of getting off your chair and actually doing something. It is good to read another article, and think of doing it “some day”. Don’t fall in this trap. It is your career we are talking about here. Do something now. Make an action plan. Decide to join Toastmasters, and call the people at your local club to find out the timings, and the next meeting. Pick a book on leadership, motivation, problem solving at Amazon or your favorite bookstore to read. Now you can pick cheaper Kindle eBooks also at Amazon. Find a workshop on Communication Skills in your city, and get enrolled in the next intake. Even if you have to pay for it from your own pocket. Do it. You won’t regret it. And don’t wait for your company to sponsor your education or training. It is your career, and you must take action on your own. The earlier the better. Do let me know if this makes sense to you. What’s your strategy, and what else do you think can jump-start your career in project management. 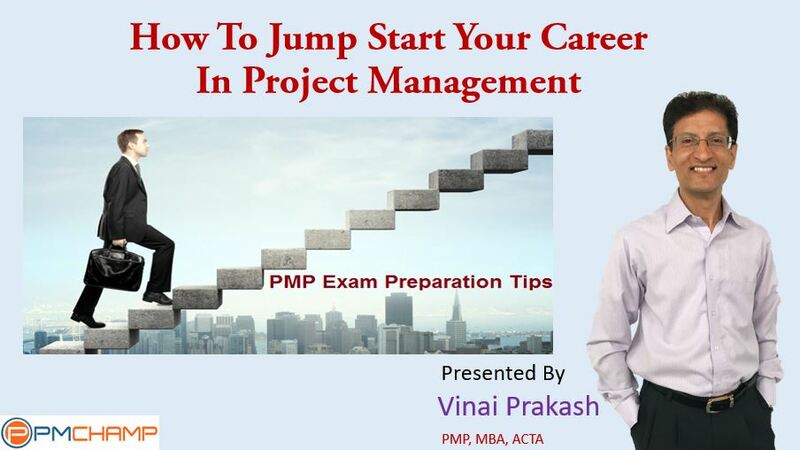 Online PMP Class at PMChamp – video lessons recorded by Vinai Prakash.